FINALLY! 40 years after it began a three year run in Cambridge Massachusetts, the story of an hitherto unknown shoestring operation has been captured in this book. A series of over 30 modest shows at Project Inc. provided the earliest dedicated venue for the nascent Pictures Generation as it began to distinguish itself from Conceptual and Performance Art. Published by Churner and Churner on the occasion of an exhibition of the same name from July 2012. The 72 page black and white book is available from them for $8. Edited by Ian Wallace, Paul McMahon’s text is supplemented by visuals from the shows, many courtesy of the Project Inc. Archive at the Center for Curatorial Studies at Bard. What do Ernst Caramelle, Gregory Amenoff, Dan Graham, Martha Wilson, Laurie Anderson, Jack Goldstein, David Askevold, Wolfgang Stoerchle, Juan Navarro Baldeweg, Charles Simonds, Douglas Huebler, Lawrence Weiner, Michael Asher, Alice Aycock, and Sol Lewitt have in common? They all showed at a virtually unknown venue in Cambridge, Massachusetts called Project Inc. Begun in 1972 by 22 year old Paul McMahon, the series ran for three years and included a total of 37 participants. Most of these shows were only two hours long and took place at a small neighborhood art center north of Harvard Square, better known for its after school fingerpainting classes. A recent graduate of Pomona College, where he studied with Mowry Baden, James Turrell and Helene Winer, McMahon figured out a way to produce the series on his income from a job at a nearby gas station. The archives from the series were acquired by the Center for Curatorial Studies at Bard College in 2010. From July 2-7 Churner and Churner will present PROJECT INC. REVISITED, the first exposition of the series since its demise in 1975, will include work from the original series plus more recent work by a large number of the series’ participants. There will be evening programs of performance and projections. 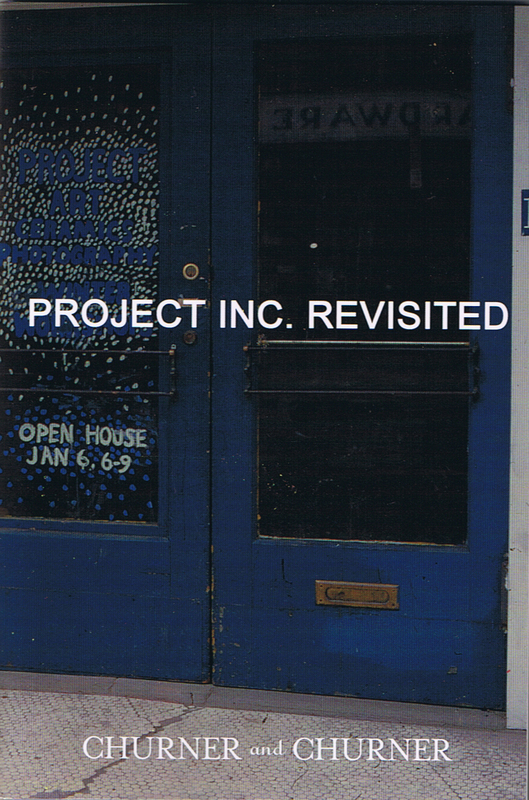 PROJECT INC. REVISITED events begin Friday May 11 with a performance by Tom Marioni at Villa Metamorphosis in Saugerties, New York.